“The border is not a wall- it’s a system of control. It doesn’t keep out predators, it gives them badges and guns. The border does not divide one world from another. The topic of Borders is one of the most discussed topics in news and media nowadays. One gets lost in the stream of tales of crisis, invasions, state regulations, support, repression, morality and realpolitik. In all this chaos, we can still feel, deep inside, that something is completely wrong with the border system, we feel it in our hearts, we think it in our minds, we read it in our books. But how do we move from the thoughts and words we remember individually to a communal feeling? 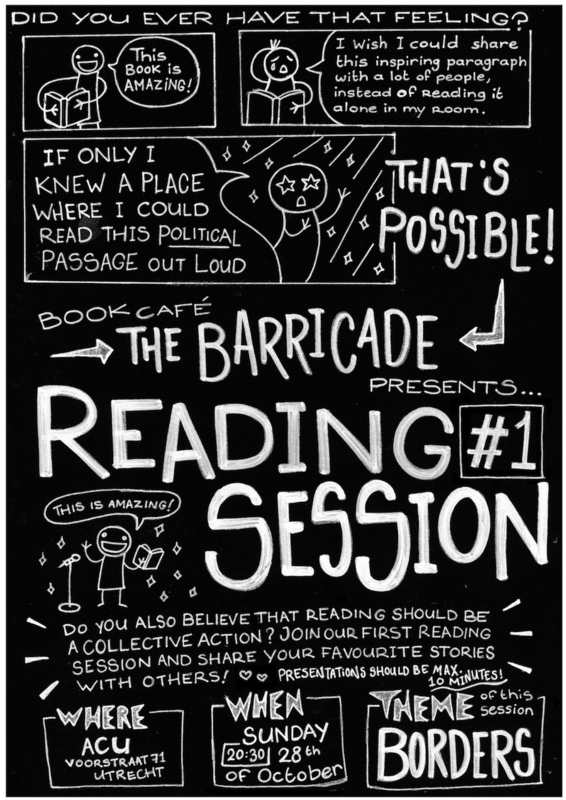 Our reading night is an event where we want to get together and share some good readings about borders. We believe in the importance of experiencing reading as a collective act as a form of resistance and in the empowering feeling that doing so can generate. Do you feel like sharing a prose text, a poem or your own words with us? Send us an email at barricade (at) acu.nl. If you don’t feel like reading, join us anyway on Sunday 28 October at 20.30 at ACU to hear some readings about borders.